Finding a kind of device fulfilled from wired to wireless? That's the right place you`re looking for. Our product TC026 is a 2-in-1 wireless audio Bluetooth adapter, Transmitter mode and Receiver mode easily as you think through sliding the switch. Not only enjoy TV shows in Transmitter mode will let you experience the imperceptible audio delay, and also with volume control in Receiver mode to modulate the sound volume when music streaming. BLUETOOTH TRANSMITTER & RECEIVER: Use the Avantree TC026 as a Bluetooth TRANSMITTER to Bluetooth-enable your TV PC, CD player, iPod, MP3 / MP4. Or use it as a Bluetooth RECEIVER to Bluetooth-enable your home stereo or vehicle and wirelessly stream music from your cellphone/PC. 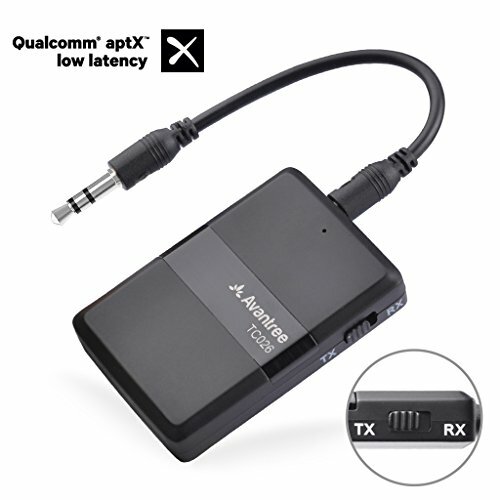 MULTIPOINT: You may stream audio to TWO RECEIVERS (e.g. two sets of headphones, or a headset and a set of speakers) simultaneously and connect TWO Smartphones simultaneously. (NOTE: Due to Bluetooth technology limitations, aptX Low Latency does NOT support Dual link mode). INCREDIBLE BATTERY LIFE & MUSIC CONTROL: This transmitter can play 10 hours on a single charge. Adjust the volume, play/pause music, or skip tracks with ease. 12-MONTH WARRANTY & ONGOING SUPPORT: Feel confident in your purchase with the 12-month warranty that's included with the Avantree TC026. You're also welcome to get in touch with our LA-based telephone support at 800 232 2078 if you have any questions about your purchase.